On this day 35 years ago the first modern computer was released to the public. It was the IBM 5150 and the pioneer of personal home computing, thanks to its innovative design, specifications and price tag. Costing a hefty $1,565, which is the equivalent of $4,150 today (£3,200), the IBM 5150 wasn't necessarily affordable. But its small size and IBM's ability to produce a a high volume of them made it the first accessible computer on the market. "This is the computer for just about everyone who has ever wanted a personal system at the office, on the university campus or at home," said C. B. Rogers, then-IBM vice president, at the 5150's launch. "We believe its performance, reliability and ease of use make it the most advanced, affordable personal computer in the marketplace." 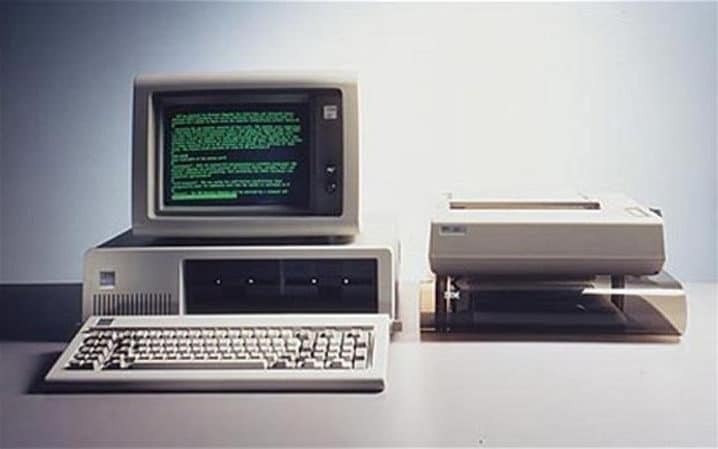 Within two years of its release tens of thousands of homes and businesses were fitted with an IBM PC and rival companies such as Dell and HP started to developing the machines that would become the computers of today. or will suffer data loss, but give me a few days of good health and I will get it up and ready for pics. working to get all pieces together, heaviest is the base, close to a megaton. thats cool, what operating system runs on it at the moment? @wonderer if you have a OS besides DOS on there .... can we have screenshots? whats the hardware config? i see floppy and harddrive controller cards but the other two full length cards could technically be anything but im guessing CGA and memory? btw the original matrix line printer sold with the system has gone long time ago as the matrix needles tended to lock and break very easy, new printer head was very expensive and I have had a good income from repairing them until IBM stopped selling the separate needles.